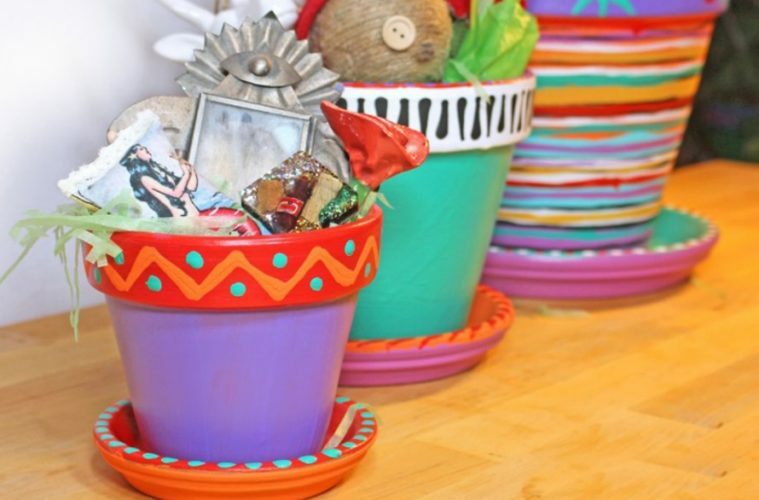 Paint flower pots, and fill with goodies to make colorful gift baskets. By CraftyChica.com. 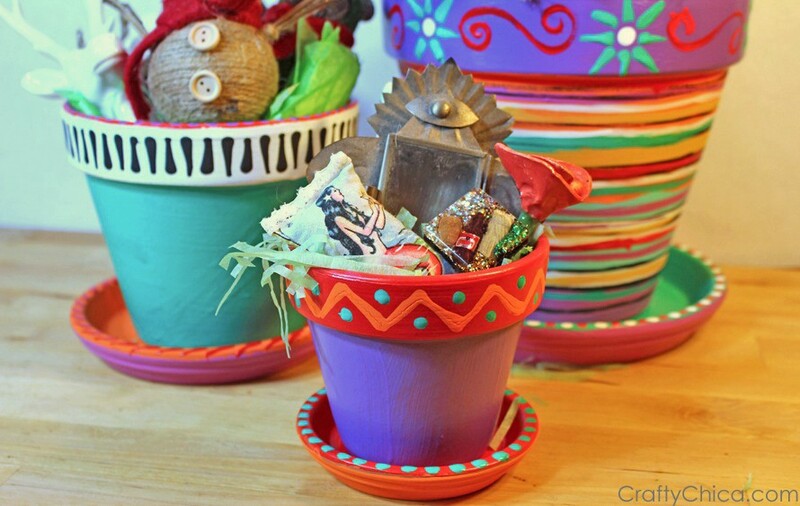 In need of creative ideas for your guests or party hosts? 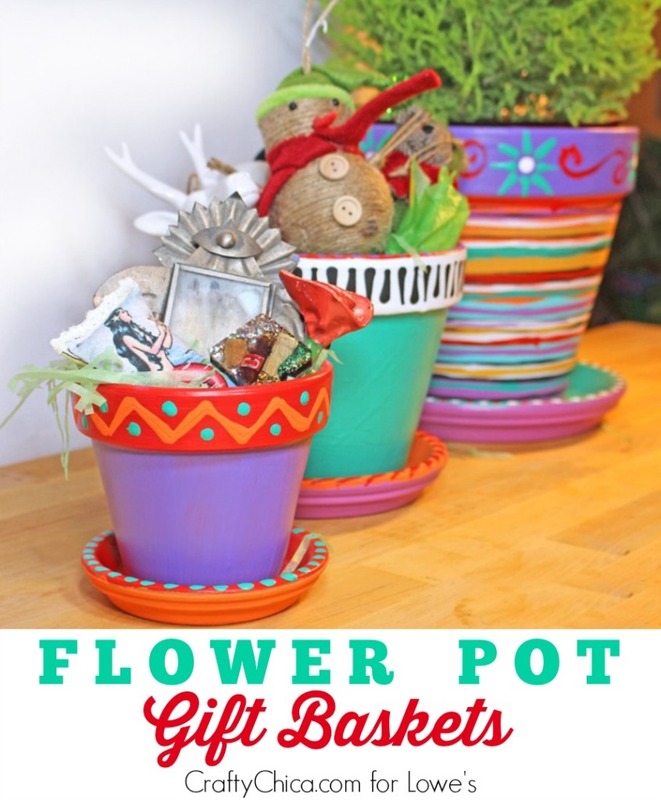 These flower pot gift baskets will be a major score! 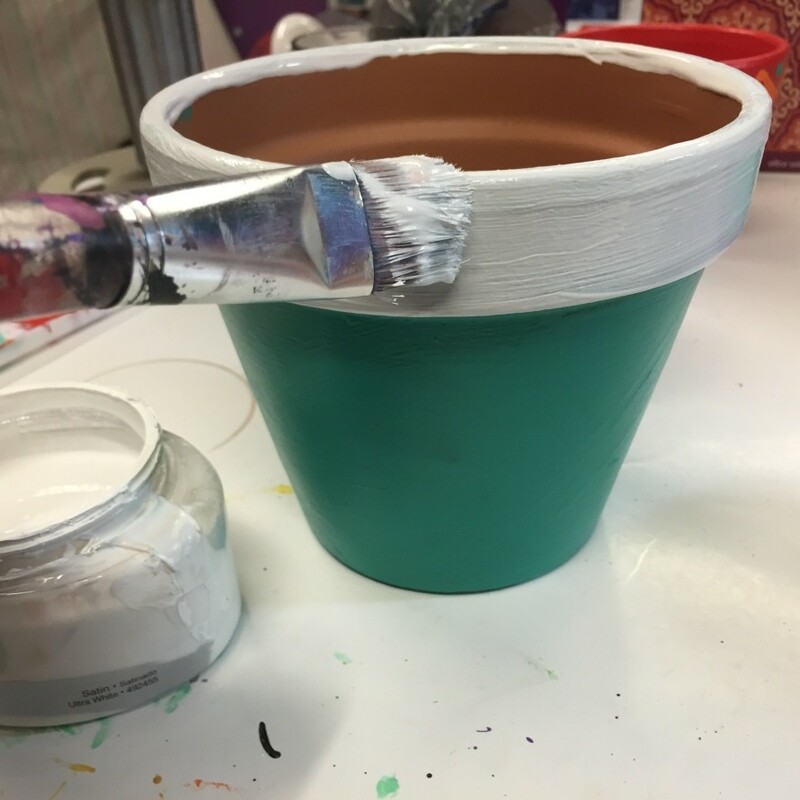 I picked up some plain terra cotta planters from Lowe’s and used the little tubs of Valspar paint samples to give them a cheery makeover. 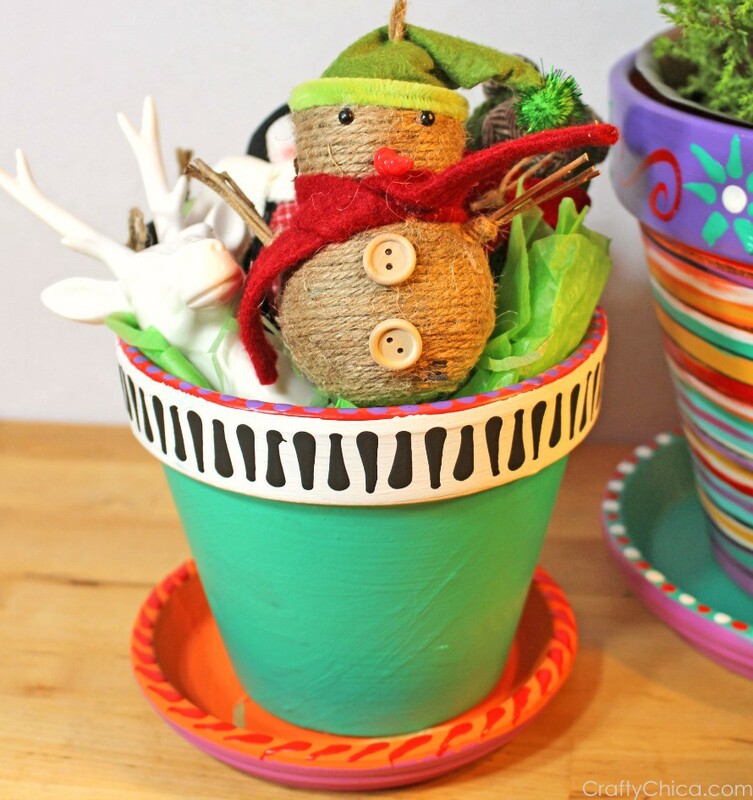 You can use all one size of pots, or mix and match as I did here. As far as what to fill them with, you can use gift cards, tree ornaments, a live tree, candy and more! 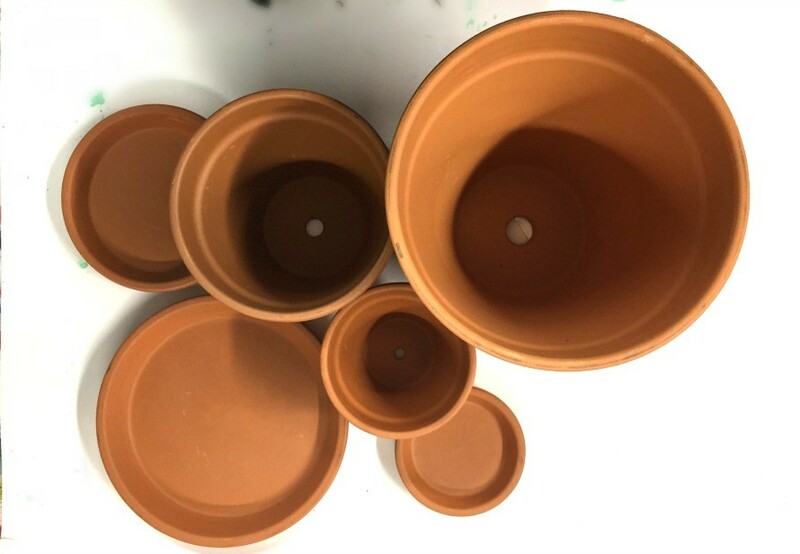 Here are the pots I started with. Use a damp sponge to wipe them clean before painting. 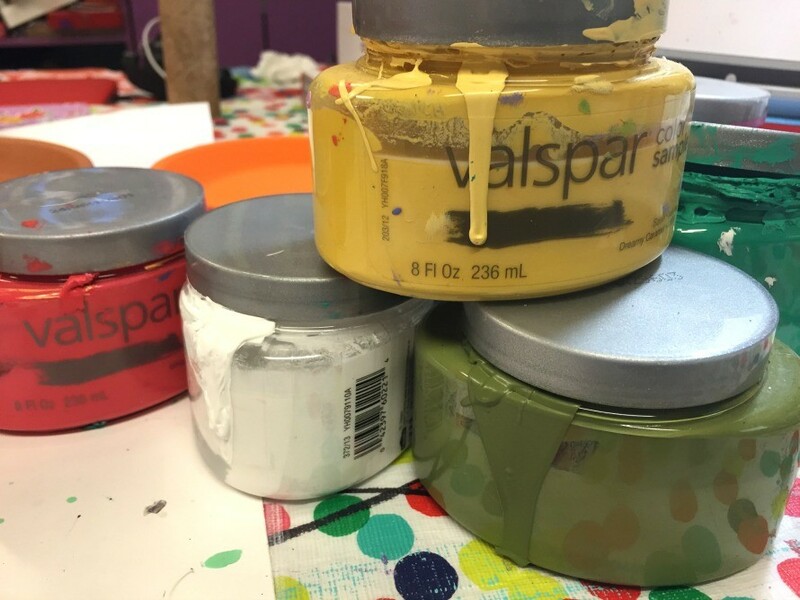 I LOVE these Valspar paint samples, they are glossy and the colors are so bright! 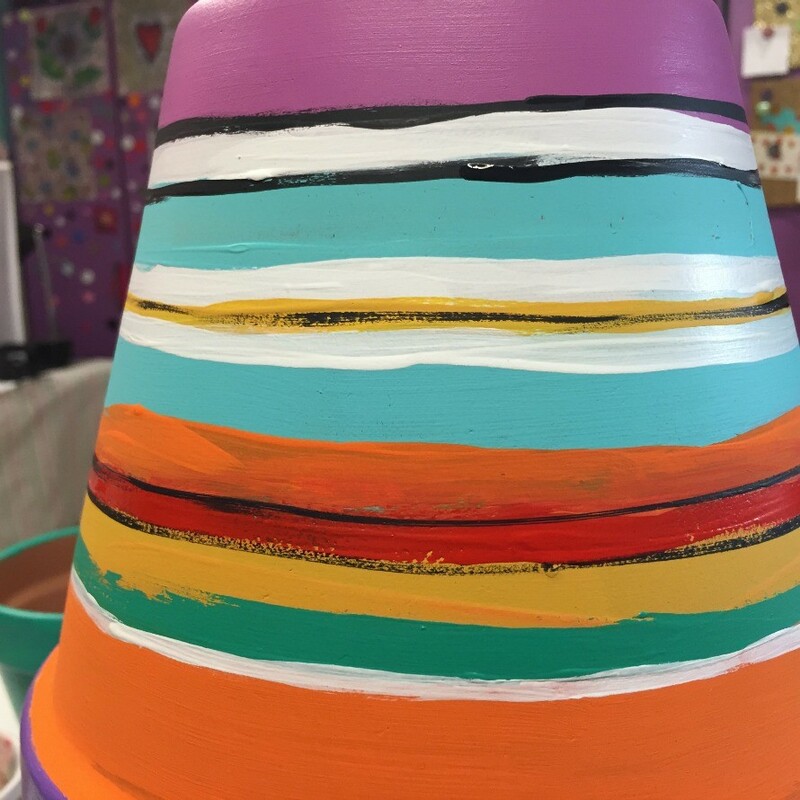 Paint the top and bottom a different color. Paint the saucers in contrasting colors as well. 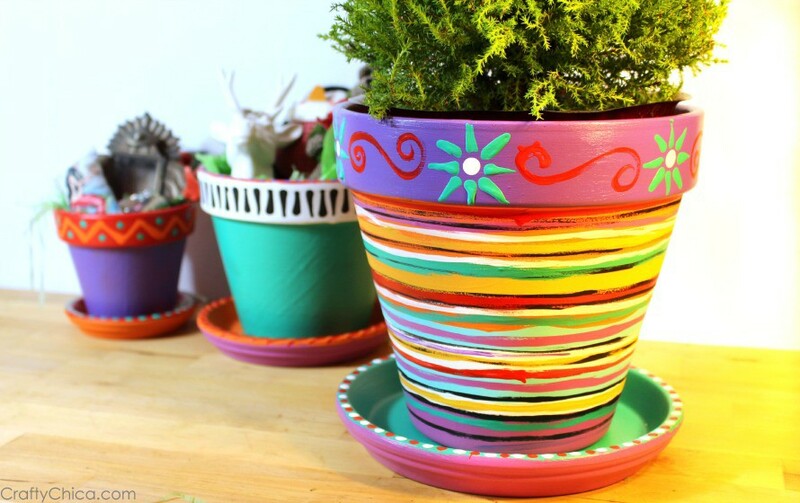 You can keep your flower pots painted solid, or add stripes or other designs. I like very busy patterns, so I added a lot of colors to my largest pot. 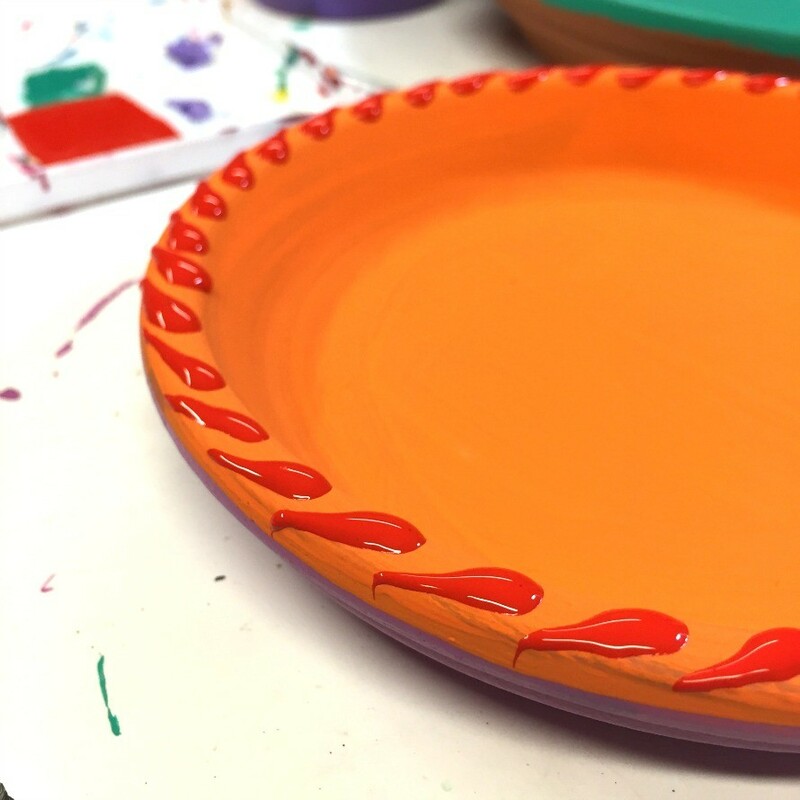 You can use a lazy Susan to spin your pot while you hold the brush steady. 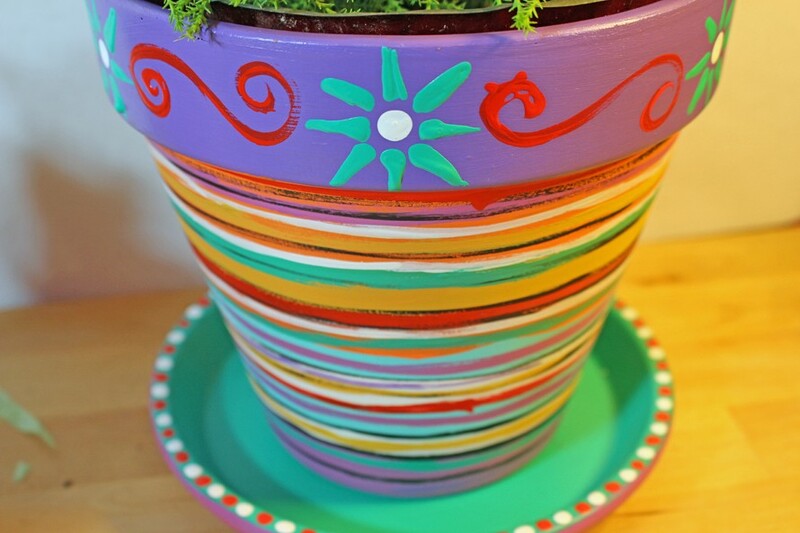 Once you have the base finished, go ahead and add patterns and designs to the rim of the flower pot. This really makes it come alive! 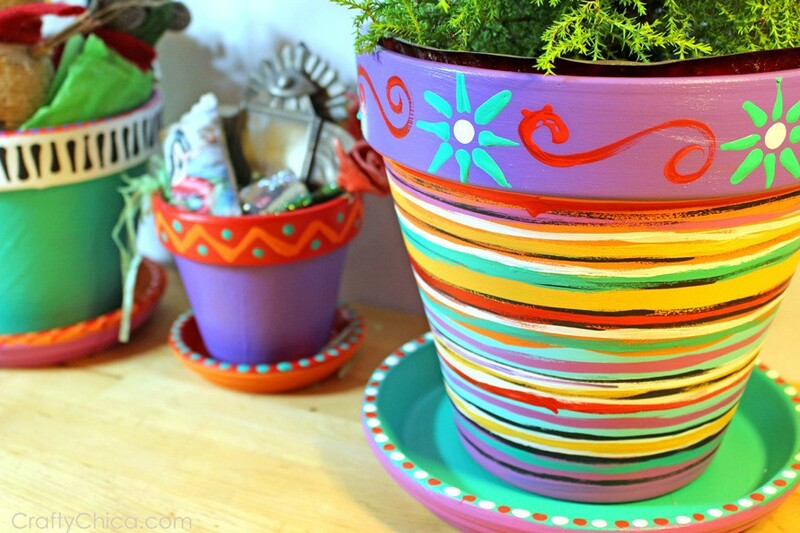 Painted flower pots by CraftyChica.com. See how I also painted the saucer to match? Next ArticleNYC: Come see me at The Casa Latina Home Expo!